Grow your own food and be self-sufficient they were told, and those who followed this advice are facing desperate times, while a ruthless mudalali mafia makes a killing with the prices as the authorities appear to be turning a blind eye to the happenings. This is Dambulla, bordering the North Central Province (NCP) described as the country’s food basin where agriculture is the mainstay and the farmer is supposed to be king. But that was in the past. Now many of the farmers live a hand to mouth existence on the brink of beggary. Every farmer, big or small is desperate as the price for their produce continues to take a free fall in the local wholesale market forcing some of the cultivators to allow their yield to rot in the fields rather than sell it at absurdly low prices. This was the sad tale of many a farmer The Sunday Times spoke to. T.G. 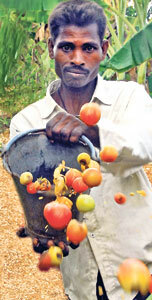 Nandasena is a father of three from the farming village of Unapanduruwewa some four kilometres north of the main Dambulla town and his main concern now is how to raise the money to pay off a loan he borrowed to invest in a tomato crop that ended in failure owing to the poor market prices. “The yield was excellent but that was the only good thing that came out of my efforts because the price offered for it was far below expectations and now I am in debt to a local mudalali who is already breathing down my neck for the money,” Mr. Nandasena said. “After dumping something like Rs. 25,000 the crop was able to fetch only Rs. 5,000 for 800 kilograms of tomatoes. Each kilogram fetched just Rs. 5. The price continues to remain the same even today, so I have decided to let the remaining crop rot out in the field. “It is counterproductive to even think of sending the produce to the Dambulla market, because of the high costs of transport and packaging. A wooden box that holds 20 kilograms of tomatoes costs Rs. 50 while transport for 17 boxes in an auto rickshaw is another Rs 425. So at the end of the day it is a futile exercise,” Mr. Nandasena said. J.A.G. Nimal Karunaratne another farmer from the same village tried his luck at growing cabbage after his tomato crops suffered a similar fate. 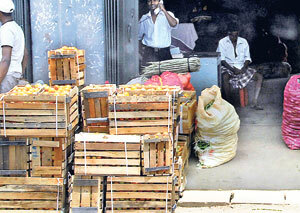 “With no decent prices for our produce it is difficult to survive,” said Mr. Karunaratne, a father of two. 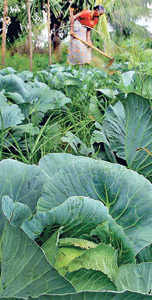 “Even cabbage, which was the best bet, is selling at a mere Rs. 10 per kilogram and we are all hoping that the price would increase before the New Year,” he added. Like several other farmers Karunaratne also wonders why the state cannot step in with a programme where their produce could be purchased at reasonable prices. “All these politicians boast of a country with a rich agricultural history, but at the same time they cannot even bail out small farmers like me. “We are a proud and hard working people asking nothing for free. The State must work out a mechanism so that our interests could be looked into at times such as this. After all they call us the kings of the land but in reality we are more like beggars,” he lamented. He added that not only tomatoes but other produce such as pumpkin, brinjals, snake gourd, wetakolu etc., were all fetching a price below Rs. 10 with only green chillies and corn fetching some reasonable rates. Gone to the cows: This picture taken last morning shows a mound of brinjals being thrown away by disheartened farmers. “The vegetable growers were further hit because they are not entitled to the fertilizer subsidy which is only available for paddy cultivators. As a result we pay around Rs. 130 for a kilogram of fertilizer,” Mr. Karunaratne lamented. “What is the difference between the paddy cultivator and vegetable growers. At the end of the day we are all farmers making equal contribution towards the food line. So why is this double standard?” he asked. Ms. H.G. Yasawathie from the same village has a healthy plot of brinjals, but they continue to remain in the field as there is no market. The 70-year-old grandmother said she has now given up future cultivation and will have to depend on her children for the rest of her life. “This is the third time in a year that I had to face such a loss. The yield has always been good, but the price is as bad as ever,” she said. The region also records one of the highest suicide rates in the country and most of them are farmers, according to statistics. The Inquirer into Sudden Deaths Piyadasa Wanasinghe said last year there were 12 suicides in the Dambulla district followed by another three this year. “Most of the suicides were attributed to family problems that arose from economic hardships among other factors,” Mr. Wanasinghe said. However, unknown to the farmers the real monster behind their misery is a ruthless market mafia that has been allowed to grow to monstrous proportions at the Dambulla Trade Centre. These mudalalis who operate in a close syndicate have taken full control of the market square forcing farmers to sell their produce at prices determined by them, The Sunday Times learns. 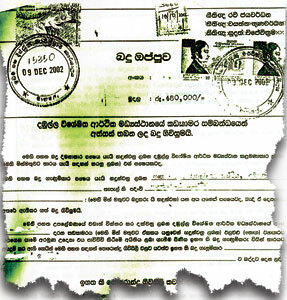 It all began with the authorities deciding to rent 144 shops at the Dambulla Market to private individuals who were selected after a lengthy vetting process. The monthly rent for each shop is a mere Rs. 6,000 and the individuals selected to operate these shops had been in the trade for over five years without a shop of their own. The low rent for the shops was mainly aimed at encouraging the mudalalis to buy the produce from the farmers at reasonable prices. But this was not to be. Things have changed drastically since this scheme was put into operation 10 years ago, and this is the main reason behind current plight of the farmers’ on one hand and the consumers on the other, a senior official with the Ministry of Trade said. The official who did not wished to be named for obvious reasons said these mudalalis had rented out some 66 of these shops to private traders at exorbitant rents ranging from Rs. 80,000 to 100,000 or more per month. “So in order to meet these huge rents for the shops the mudalalis bargain and get the produce at cheap prices from the farmers and in turn sell off the produce to wholesale traders at higher prices. At the end of it all both the farmer and the consumer are affected while the so-called mudalali makes a killing at the expense of others,” he said. The official blamed his ministry for allowing the situation to get out of hand without nipping it in the bud. He further added that the time to strike was now, since the 10-year lease period for the shops expired last week. The authorities could now easily move in and take over the shops and hand them over to honest people who will work for the benefit of the farmers. He added that another group of about 30 to 40 people were stocking up vegetables to create a scarcity in a bid to jack up the prices. This group, he said purchases the vegetables from the trucks entering the market, which is then hoarded for several hours allowing the price to increase before releasing it for sale. “This too is done with the connivance of the mudalalis”, he added. Lalith. R. De silva, Secretary to the Ministry of Trade and Consumer Affairs told The Sunday Times that several policy changes are currently being formulated aimed at eradicating the irregularities at the Dambulla Economic Centre, including the so-called trade mafia. “We hope to implement these policies at the earliest, because the current situation was hurting both the farmers and the consumers alike. The matter is being given the utmost priority and there will be changes in the coming weeks,” he said. He would not comment on the proposed changes, only to add that they were awaiting a directive from the cabinet before taking the necessary action. He added that the Ministry has also taken several other measures to eradicate the so-called mudalali mafia that had been allowed to expand over the past decade. “We are within our rights to get them out and this is going to happen very soon, Mr. De Silva further said. Other sources within the same ministry said that attempts to re-organise the functions at the Dambulla Market were being dwarfed by ‘regional’ interference both politically and otherwise. Indian oil to seep to Jaffna? Why do elephants come back home?